A former Seoul National University graduate student has publicly accused a professor of sexual misconduct and condemned the school for lack of punishment for the perpetrator, stoking the flames of the #MeToo movement on the campus. 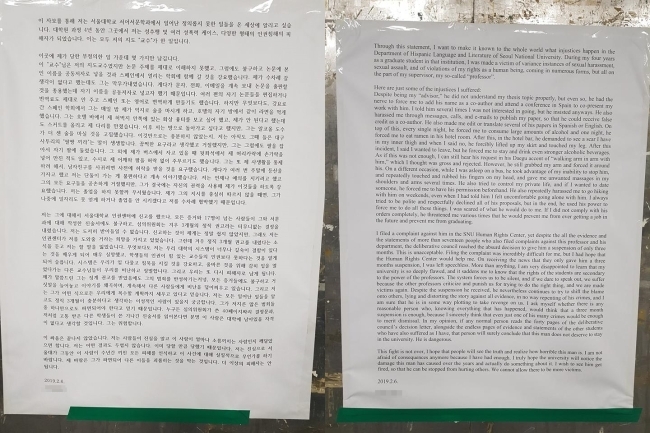 The student posted flyers written in Korean, English and Spanish at the campus Wednesday, calling for students’ attention to wrongdoings committed in the Department of Hispanic Language and Literature. “During my four years as a graduate student in that institution, I was made a victim of various instances of sexual harassment, sexual assault, and of violations of my right as a human being coming in numerous forms, but all on the part of my supervisor, my so-called ‘professor,’” she claimed in the English version of the poster, in which she did not name the professor. According to the victim, the professor insisted on accompanying her to a conference held in Spain after pressuring her into adding him as a co-author to her thesis. He then sexually harassed her several times during the trip. The student said the professor forced her to drink large amounts of alcohol and demanded to see a scar on her inner thigh at the hotel bar. She said he then forcibly lifted her skirt and touched her leg even after she declined to show her scar. In addition, the professor grabbed her arm and forced it around his and gave her unwanted massages to her shoulders and arms several times, she added. He tried to control her by forcing her to get his permission before dating someone, she claimed. “I always tried to be polite and respectfully declined all of his proposals, but in the end, he used his power to force me to do all these things,” the alleged victim said. The student also bashed the lack of punishment by the school after it came to light. As she reported the case to the SNU Human Rights Center with 17 other students’ statements alleging his wrongdoings, the school confirmed the professor inappropriately touched the student at a hotel bar in 2017. The center handed the professor a three-month suspension. The victim argued she cannot accept the “absurd decision” from the deliberation council and urged the school to terminate him from the university. The student council of the College of Humanities also supported the victim’s claims, saying SNU should carry out a thorough probe of the professor’s misconduct and ban him from classes. “We will keep asking the school to expel him, as we believe such precedent should not remain in our school. Students can fear that the professor who violates human rights and who committed sexual abuse may return to school,” Lee Soo-bin, president of the SNU student council, told The Korea Herald on Friday. Meanwhile, the professor reportedly said the allegations are exaggerated and that he touched her leg as he was worried about the student’s injury. In January, he filed a complaint with police against two graduate students and one part-time lecturer, claiming the three handed over his private emails to the school’s investigation team without his permission.